A space explorer and a cranky crystal hungry octopus: this is Nebs 'n Debs! Nebs 'n Debs is a new (released in 2019) game for the original Nintendo Entertainment System. Run, jump, and dash your way through 12 levels as you search for the missing parts of Debs's ship to escape the hostile alien planet Vespasian 7MV! Nebs 'n Debs started as a 2016 NESDEV Competition entry. That demo version of the game won 2nd place and is included on the Action 53 Volume 3 cartridge. Since then, Dullahan Software's Chris Cacciatore and friends have developed the full game with updated graphics, physics, and more music. Hello! I'm juef and this is my fourth TAS, and the first of Nebs N' Debs. The ending is reached in 37585 frames. The very impressive current world record by Rayquaza911 only completes the first loop of the game, which is done in about 16 seconds less in this TAS. Please note that the rerecord count isn't exactly accurate, as the second loop is mostly copied/pasted from the first loop, with some changes due to differently initialized memory and faster enemy speed, notably. If A is held appropriately, Nebs conserves her vertical momentum after a dash. This is used to reach places that can't be reached otherwise and/or to have her dash recharged at a better place. Sometimes, you can jump right after dash. This is used in the same ways as the above trick. Potions increase the dash length, and you can have up to two. Since dashing is faster, more potions is better: it's actually only worth dashing when you have at least one potion (which is thankfully the case very shortly into the first level). Sometimes, one route forces the player to interrupt a dash (because of a wall, for example), making it slower than another seemingly less direct route. 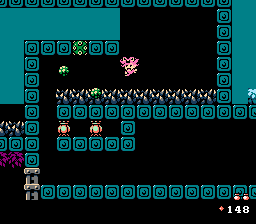 For example, in the first level, going through the rock might seem faster than going over the level for a while, but the dashes don't "fit" as well for the rest of the level to actually make it faster. This is the kind of thing that pretty much had to be tried and measured. When the player is blue, the dash is actually recharged for a couple of frames before she becomes pink again. (Not so) fun fact: you can outrun the drone bosses if you dash too much: the screen will simply scroll over it, and it will disappear forever, essentially softlocking the game. It is possible to only despawn the ship piece that way, but then beating the boss will also softlock the game. Therefore, we have to delay some dashes in order to finish the level. Being close enough to certain objects / tiles can give your dash ability back without you touching the ground. This is used many times, for instance in Level 5, where the dash is ended a bit prematurely so that this trick is used with the trampoline plant. 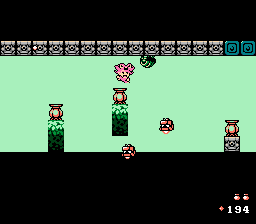 That, plus the jump-after-dash, saved over half a second from simply bouncing off the plant. It is often faster to walk to the sign at the end of a level and activate a dash for one frame to spin it. However, if the distance between the player and the sign is great enough, a full dash can be worth it. You don't have to touch the mines for them to go off: just being close enough triggers them. Since their explosion will damage the player even when dashing, in the first level with mines, it is faster to make a short dash over it rather than trigger it and wait for the explosion to be over. When the last ship piece "teleports" between the two drones, getting to close to the edge of the screen before the 2nd drone starts moving will prevent the screen from scrolling, and will therefore softlock the game. The ending is a bit different once you beat the game on the 2nd loop. Notably, the timer and enemies are faster, 1ups are downgraded, and some more little differences. Should improvements come up (and I hope they will), I suspect they will mostly be from movement optimization and different in-level routing. There is definitely more studying to be done, notably about subpixel positions and speeds. For example, I know the first level can be finished 2 frames faster by making a 1-frame fash over the sign, but for some reason, it makes things not go as well in the second level and more than two frames are lost. Thanks to Chris Cacciatore for the great game, and Rayquaza911 (current WR holder) for the great speedrun! I've just been informed that there is a glitch allowing to maintain dash speed in certain conditions (I don't know which ones exactly yet). I will definitely investigate and redo the TAS if the findings are worth it, but in the meantime, I suppose I can leave this submission open? ThunderAxe31: The very first thing that got my attention was the fact that the RTA WR is just 16 seconds slower, which is a relatively small difference in my opinion. So I took my time comparing the strategies used in this submission and in that RTA run, and I noticed that there are many different routes used between the two. Then I tried to TAS the first level myself, which resulted 44 frames faster (movie file here, no need to credit). Another problem is the fact that the speed glitch has been not used. While it isn't clear about what causes this glitch and why it can't be used for all enemies, I also have to note that there are many spots in the game where it can be used for certain. Apparently, it seems that the glitch can be reproduced if you have two Dash Potions and you stop the dash while killing the second enemy in a row. This movie isn't very bad, but it lacks the usage of some known strategies in many places through the run, and it would require to redo everything from scratch in order to implement these. Thus, I have to reject this submission for suboptimality. Better luck next time!